used by shorebirds that nest right on the sand? Plovers, Terns, Oystercatchers, Skimmers and Killdeer are among the many shorebirds who nest on busy beaches. Many of these birds are very small and nature has camouflaged them perfectly so they are nearly impossible to see when they are sitting on their eggs. This is ideal because their predators can’t see them, but then again, we can’t either! And their sand-colored babies, like this adorable days-old Least Tern chick above, are small, fast and extremely vulnerable. 1 – If there is a roped-off area on the beach with signs indicating there are nesting birds and not to enter….this is a birds-only nursery area! No dogs nor humans should enter as eggs and babies are extremely vulnerable and are easily unintentionally harmed. 2 – Birds nesting on beaches are easily disturbed by any predators….or perceived predators and will fly away from their eggs or chicks to defend the area leaving them vulnerable to predators like gulls or to overheating by extreme temperatures. Please don’t walk your dog off or on a leash near any of these nesting areas! The birds don’t know your pet is harmless and just his presence will send the birds off in fear, exposing their babies. 3 – Keep your eyes open for bird activity on the beach. Parents will take their teeny babies outside the roped-off areas to the waters edge to feed and they need to be able to stay together so the parents can defend them. If you are near the parents and chicks, don’t walk between them or separate them. If you find its happened by accident, just stand still. The parents will round the family up and you can be on your way once they are reunited and they are on their way together. Audubon NY has some excellent information about beach nesting birds at any beach and how you can help keep them safe. Your kids can sign the Be A Good Egg pledge and get their friends to do it to. 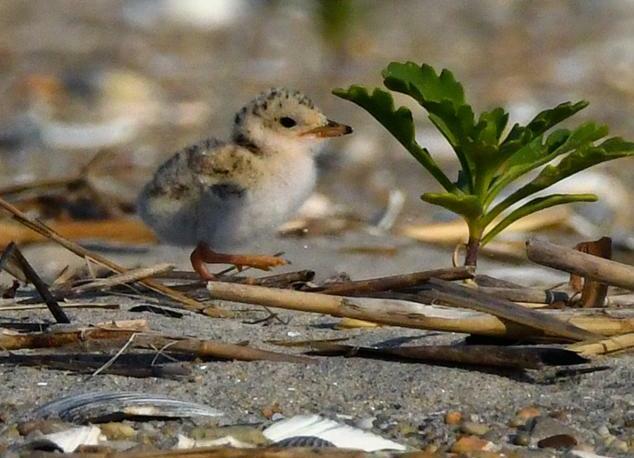 It’s easy to keep baby shorebirds safe – tell your friends when you are at the beach!